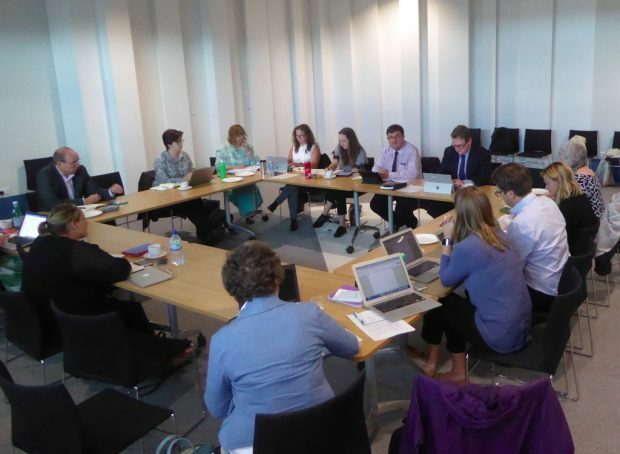 The 21st meeting of the Libraries Taskforce was held in Warrington. Steven Broomhead, Chief Executive of Warrington Borough Council, and new chair of the Taskforce, welcomed us to Orford Jubilee Park. Opened by the Queen in her Golden Jubilee year, this complex located a couple of miles north of the city centre houses Orford Jubilee neighbourhood hub. It was fascinating to tour a building with so many services co-located, and see how they interlink to provide an overall place which contributes to the health and wellbeing of the community. The library is highly visible within the building, as it has floor to ceiling glass along one side, which runs parallel to the entrance hall. It contains the usual spaces for children, quiet reading corners, comfortable chairs and study tables. The library staff have a desk in the centre, but there are quick picks and self service checkout/return terminals in the entrance. Our tour gave us a flavour of the wide range of organisations which are housed in the building, and services offered. We also heard about the wider links forged with their neighbours on the site - for example a local college and secondary school. Students from the college who are studying for qualifications in sports subjects are able to gain practical experience working with the different trainers and benefit from the fitness suites with their state of the art equipment. Professional sports men and women also work with the dieticians and fitness experts. Besides the sports facilities, which include gym, swimming pool, multi-sports hall and squash courts, the hub is home to a variety of local services including community police officers, Citizens Advice Bureau staff, Macmillan cancer advice and support, a creche and a cafe. There is also, in a slightly separate area, a medical centre with 4 GP practices and a number of consulting rooms where clinics run. During the tour we also heard about the even newer hub: Great Sankey neighbourhood hub, opened in early 2018. It was designed with dementia friendly standards throughout. We look forward to reading more about what they did and how it is being received in the future. 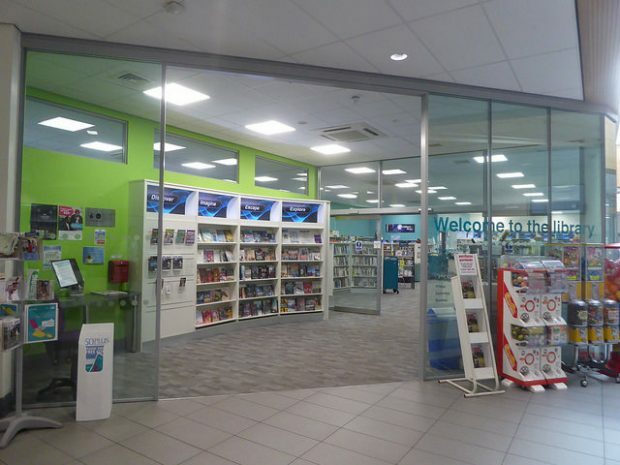 There are 12 libraries in Warrington, which since May 2012 have been managed by LiveWire Warrington, a community interest company which also manages leisure and lifestyle services. Following a consultation in 2016, the council announced plans to close 5 libraries, and relocate central library. This led to high levels of concern locally and strong objections were raised. The Save Warrington Libraries protest group was formed who were particularly vocal. In response, the borough council set up a Libraries Working Group (chaired by Steven Broomhead) which included representatives from the council, LiveWire and the SWL group. The group’s recommendations were put forward and accepted in December 2017, and the working group has transitioned to become a Libraries Partnership Board. Before the full Taskforce meeting we had a series of presentations, and heard from Councillor Tony Higgins, who holds the leisure and community portfolio. He gave a powerful introduction which charted his shift from being a member of the Building stronger communities committee, which had put forward the original plans, to becoming a committed supporter of the new plan. We then heard from Emma Hutchinson, managing director of LiveWire, and Eleanor Blackburn, head of strategic partnerships and commissioning. They introduced the Livewire hubs with a quote from one of their users: “it’s like a supermarket for the mind, body and soul”. They talked about their integrated delivery model, which aims to open up the library to more users, provide longer opening hours, introduce new opportunities for partnerships, volunteering and collaboration, and offer potential income generation opportunities. Besides the neighbourhood hubs, smaller libraries are also looking for opportunities to combine services. A Post Office has opened in Burtonwood library, and a centre to support local and/or business is planned for Lymm library. Each library has been considered individually, and has a needs assessment, financial assessment of each option, and communications plan setting out the future plan for the promotion of libraries, plus ongoing support for the development of Friends groups in each library. Emma described projects which the library service runs with partners, each of which have had significant effects on individual lives. Rugby Reading Champions is a scheme that has been running for several years in partnership with the local rugby league team: Warrington Wolves. Young people are offered the chance to speak with the players about their favourite books, and during World Book Night, players gave out books. Reading Hack and Reading Ahead schemes are active, and we heard about a young volunteer who has now returned to the library as part of her studies, plus a refugee who originally had very low literacy levels, and is now studying for a PhD. 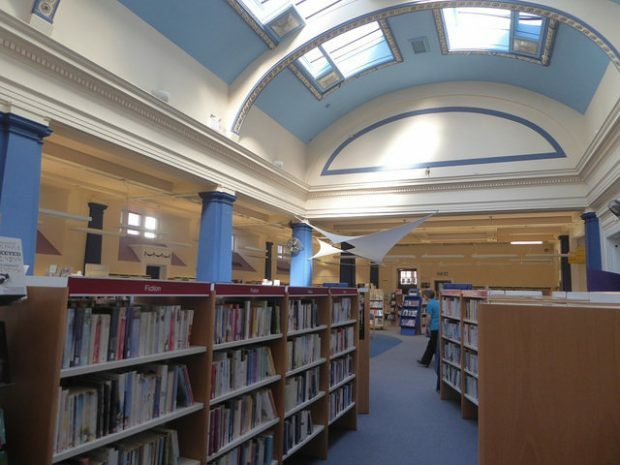 Other investment secured since the Libraries Working Group presented their recommendations includes up to £1 million into building maintenance and remodelling. LiveWire have committed to maintaining the current libraries revenue budget for 3 years, and increase the book budget to £150k per year in 2018-19. There will also be a one off investment from Warrington borough council of £150k into the book budget. Libraries are now an integral part of the Livewire delivery model - and the stated intention of working closely with partners and representatives from different communities is already showing benefits in increased activities and participation in those activities. The contribution made by Friends groups is making a difference too. Taskforce members heard from Gary Borrows, who represented Save Warrington Libraries, and was also a member of the Working Group. He has a background in running libraries, and was clearly a powerful advocate for the many different people who came together to respond to the council’s original plans. He reported that he felt they “had now reached a turning point in the fortunes of our library service”. He stated that he felt the research and evidence that the group was able to gather, and the publicity they achieved for their work, added up to a powerful advocacy base, and contributed to them being included in the Working Group, so they could contribute to development of the new library strategy and implementation plan. Gary gave credit to Councillor Higgins, and Steven Broomhead who had chaired the group. He said he felt the meetings were inclusive and achieved a good measure of trust and a genuine dialogue. He ended by saying the group is optimistic. “While Warrington didn’t quite make City of Culture…. they have laid down a marker. And they have created a Cultural Commission, which has already headlined libraries and says if you want to encourage grass roots culture, then library venues in the community are the natural choice”. The rest of the day was spent in a full Taskforce meeting, minutes of which will be published on GOV.UK. Our next meeting will take place on 11 December in Colliers Wood library, Merton. We also had time before our train to visit the oldest public lending library in the UK. As several libraries have similar claims (many think of Chetham’s in Manchester - which is the oldest free public reference library in the UK), a bit of research revealed Warrington was the first town in the United Kingdom to open a rates-supported public library. It evolved from a long-established private subscription library that had been operating in Warrington since 1760 from the premises of the printer William Eyres. In 1848, the town’s first Mayor, William Beamont took advantage of the government’s 1845 Museums Act by vesting the Society’s books and artifacts in the council. The Museums Act allowed boroughs with 10,000 or more people to raise monies for the establishment of museums and thus, almost by default because of its sizeable book collection, Warrington became the first town in the country to have a municipal library. Canterbury and Salford followed this model later in the same year - adding library annexes to their museums. The present building - which still houses museum and library - was opened in 1855 and is Grade II listed. [thanks to Warrington History Society for the information on this library]. Great ideas, the way forward for a lot of communities.